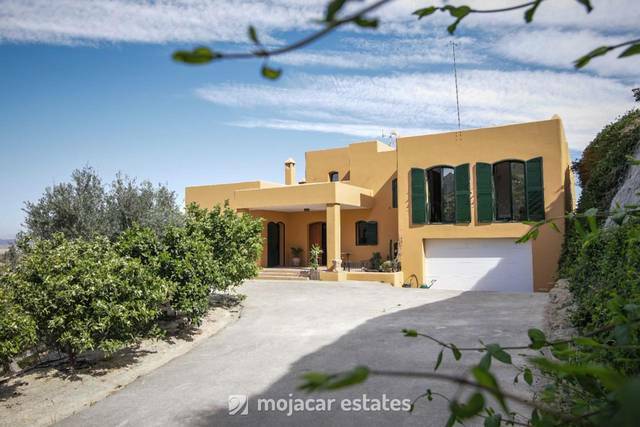 This is a beautiful country house style villa that has been built to the highest standards with thick walls, high ceilings (3.2m), tall windows and doors, handmade terracotta tiles and stunning views to the sea and the Cabrera mountains. 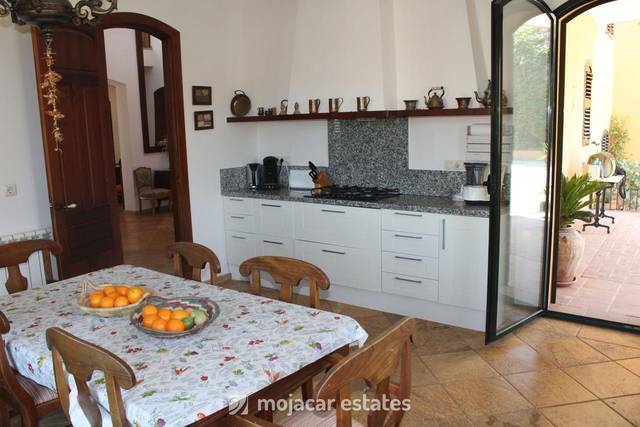 The house sits on a hill in a wide valley surrounded by beautiful countryside with the Cabrera mountains stretching up behind. Dotted around the house are all kinds of trees including carobs, olives, palms, pines, figs, cypreses, jacarandas, acacias and fruit trees that include: pear, plum, cherry, peach, apple, orange, mandarine, lemon and lime. All the plants are on an integrated watering system. 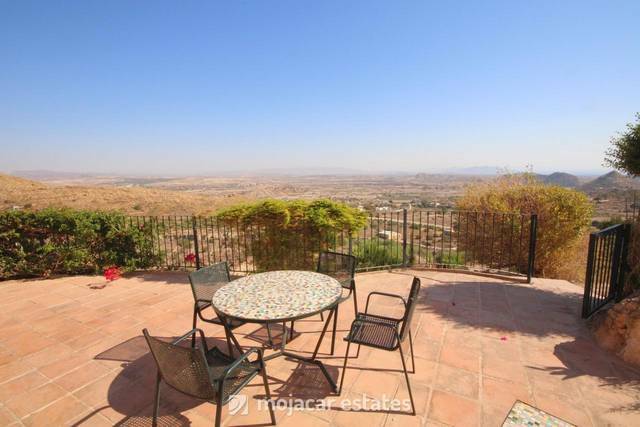 It is completely private, no neighbours overlook the property, which is a rare thing. The driveway leads to the grand entrance of the house, 3 steps take you up onto the porch with a small fish pond. The imposing front door opens into an entrance hall (with cupboards all the way along one wall) and double doors with stained glass windows that open into the inmense sitting-dining room. There are double windows all the way around the room. 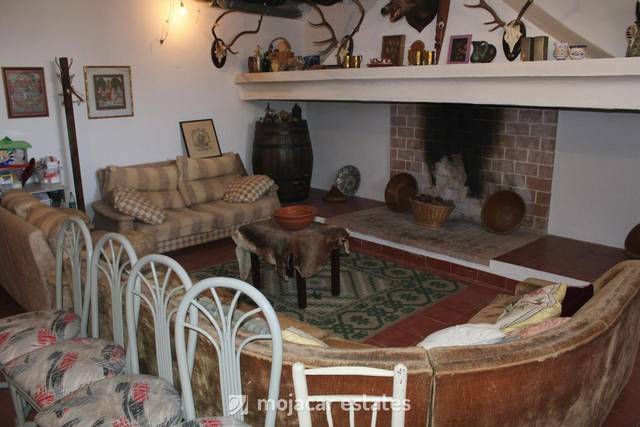 There is a large open fireplace with an elegant mantelpiece. 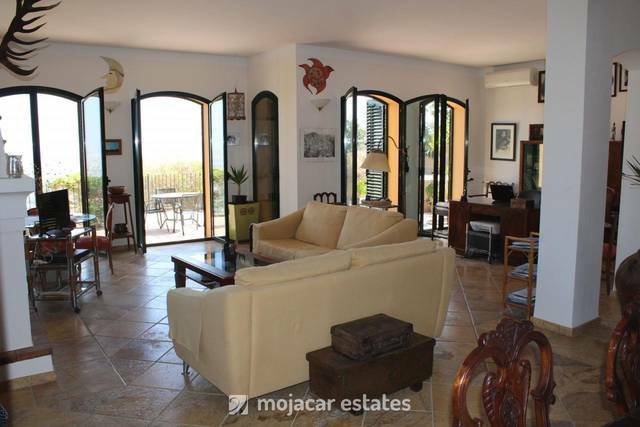 The windows lead out onto a terrace with panoramic views to the sea. Part of the room is the study/office area with desk and bookshelves. 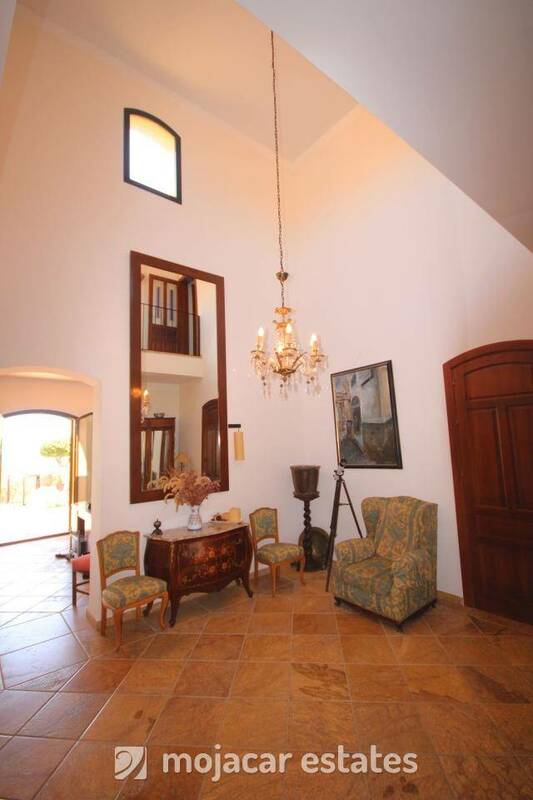 The high ceilings make it incredibly spacious. The large, fully fitted, kitchen is off to the left with windows to the terrace and entrance. 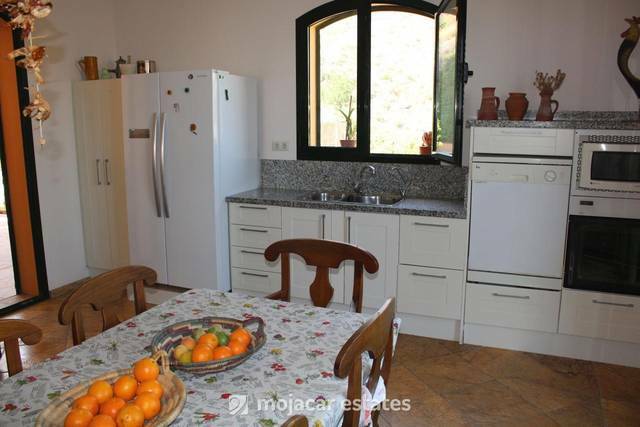 It has a breakfast table, double fridge and fabulous views of the mountains from the kitchen sink. All the doors and windows are much higher than the normal height. The carpentry of the doors, wardrobes and floors is of a very high quality with a beautiful finish. From the terrace with panoramic views you walk into the terraced garden filled with indigenous plants such as broom, lavander, rosemary, fennel, ivy, prickly pear cactus, asparagus, galan de noche and esparto grass. This is all fitted with a watering system. The owners´ intention was always to keep the garden filled with indigenous plants so as to be as much in keeping with the surrounding protected countryside. The outside buildings have been built to have a low impact on the environment. From the sitting room there are stairs up to the bedrooms and down to the basement. 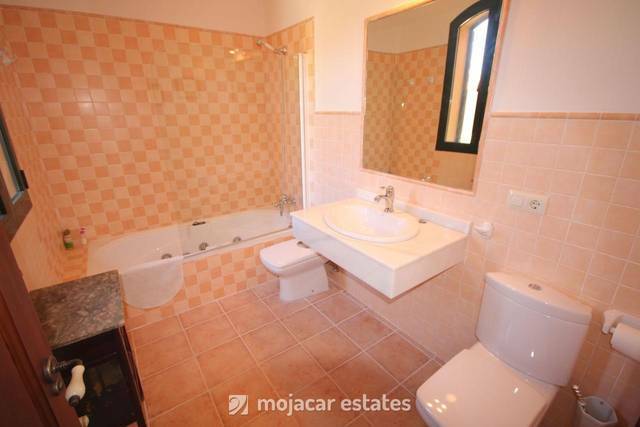 Here on the landing level is a guest cloakroom with a window and a heated towel rail. Upstairs on the first floor are the 3 large double bedrooms. 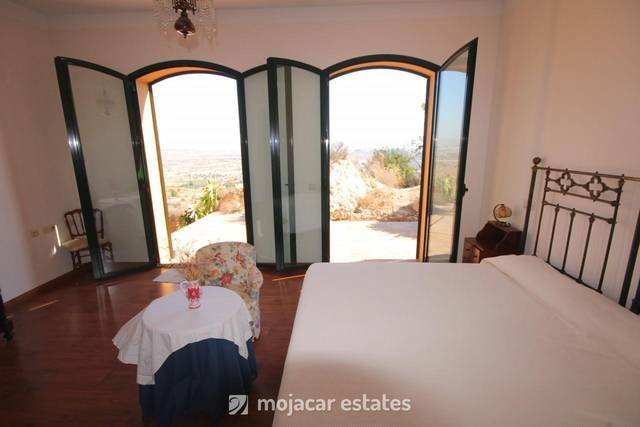 The master bedroom has 2 tall, large double windows that lead out onto a terrace. One of the walls is covered in honeysuckle. There is a dressing area with plenty of wardrobes made of solid wood and an ensuite spacious bathroom with shower and a heated towel rail and a window for natural light. 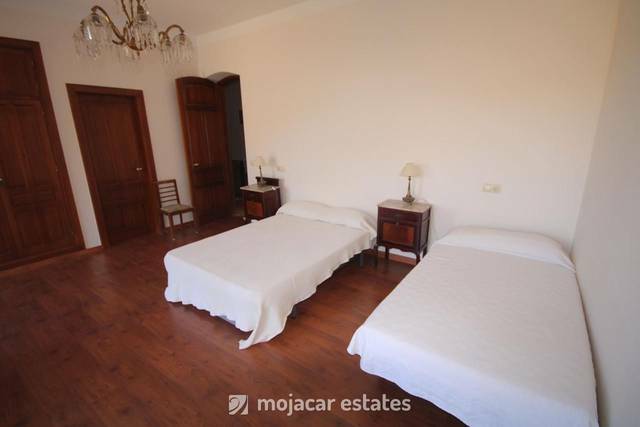 The second bedroom is very large and easily accomodates a double bed and a single bed with room for further beds should it be necessary. 2 balconies look out onto the mountains. There are solid wood wardrobes all along one wall of the room (fitted inside with drawers and rails) and a good sized ensuite bathroom with a Jacuzzi bath, window and heated towel rail. 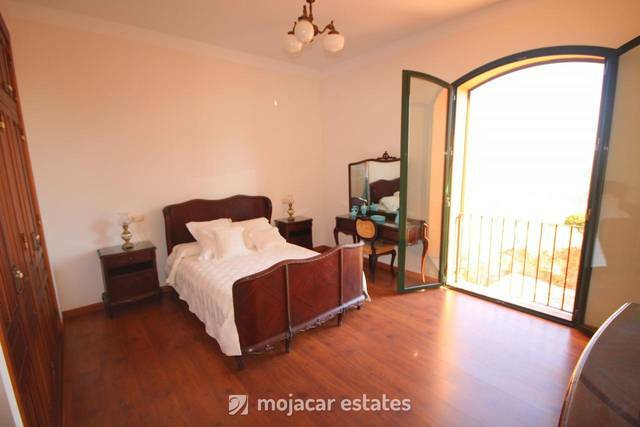 The third bedroom is also large and has a balcony with views to the sea. Fitted solid wood wardrobes along one entire wall of the room and an ensuite bathroom with shower, heated towel rail and instead of a window there is a skylight. 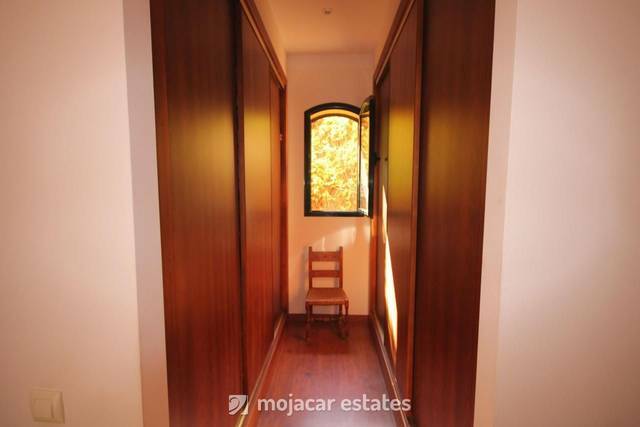 All 3 bedrooms have solid wood floors and are equipped with AC units and central heating that is fuelled by diesel. 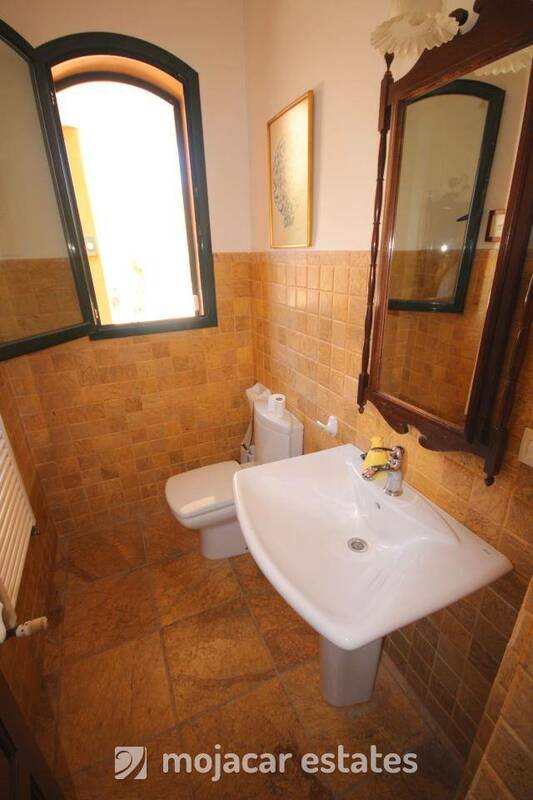 All the bathrooms have beautiful handmade tiles. There is double glazing throughout the house and all the windows are made from excellent quality aluminium as well as the external shutters. The solid wood carpentry is beautifully finished. Stairs lead up to another floor with a walkway that crosses part of the sitting room and then takes you out onto an enormous terrace that covers the entire roof area of the house. From here there are 360º views of the mountains and the sea. The owner has made a pre-installation for solar panels for hot water and there is also a tap for watering. 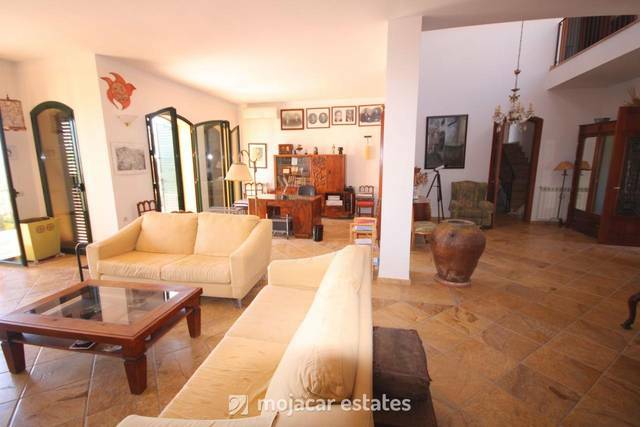 In the basement there is a large games room with sofas and a large open fireplace that draws perfectly. There are windows for natural light. 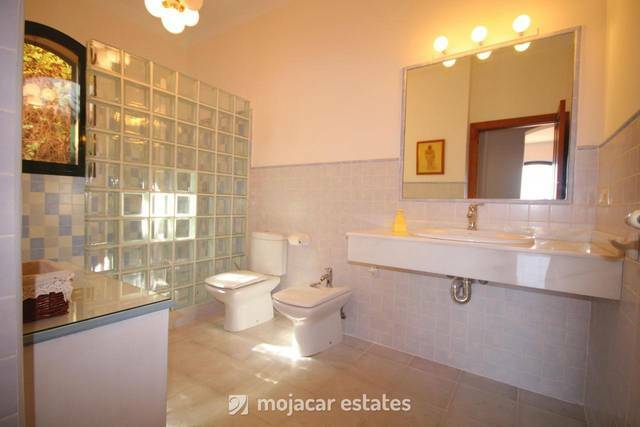 There is a bathroom with shower and a window to the front of the house. There is a separate store room that houses the washing machine and tumble dryer and another room for the filter system and descaling filter. The garage is open to the games room and has plenty of room for 2 cars. The garage is fitted with an electric door. The pool is a short walk from the house, down some steps made from reclaimed wood. 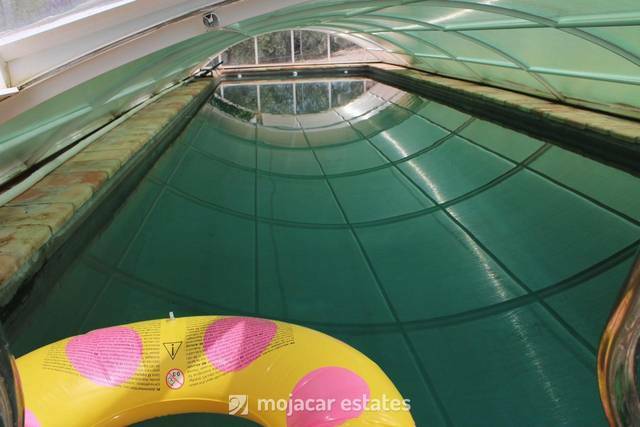 The pool is heated and covered (cover can be removed) and measures 15m x 3.5m. Next to the pool is a Jacuzzi in an enclosed glass area. The land is planted with 265 olive trees (125 arbequinos and 140 mediterranea or del país which produce roughly 2000 kilos of olives). 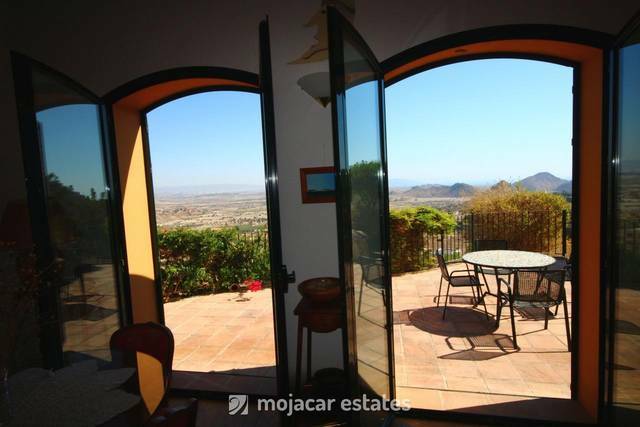 There is a water deposit (100m3) that is filled from a natural water source in the mountain and the finca is alloted 2 hours every 24 hours from 11 to 1pm (about 50,000 litres of water). Below the pool area is a hut with another water filter and heating for the pool, plus an enclosure for dogs. Part of the land surrounding the house has been fenced off to allow for dogs to roam freely within this area. It is accessed through an electric gate. 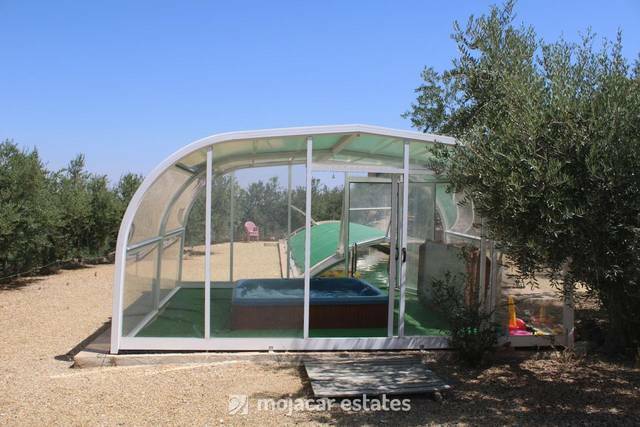 All kinds of fauna can be seen in this beautiful corner of Mojacar including rabbits, wild boar, foxes, moles, tortoises, lizards, owls, partridges, humming birds. The house has been built with thick walls and very good insulation, terracota tiles inside and out, solid wood floors in the bedrooms, arched excellent quality double glazed windows in aluminium frames with outside slated shutters, AC units (hot and cold air) as well as central heating fuelled by gasoil in all rooms, high ceilings measuring 3.2m and a video phone security gate entrance. 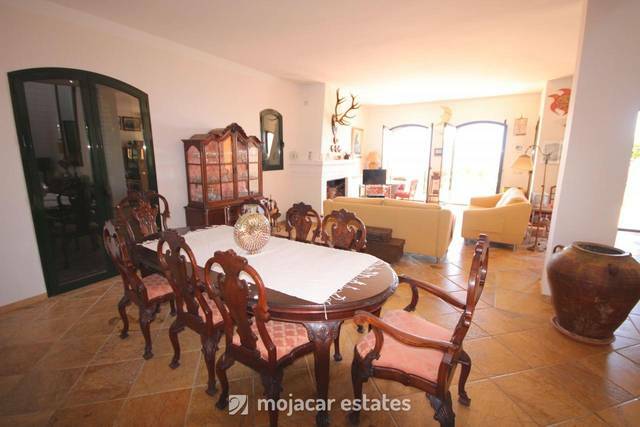 The house is located between the villages of Turre and Mojacar, and is close to all the services and amenities provided by these. The road leading to the house is tarmac all the way, and this goes right up to the front door. This is a house that must be seen to be appreciated!